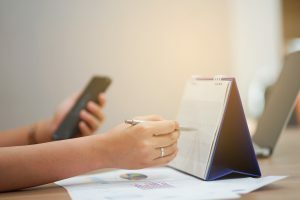 As the world changes and technology evolves, many businesses are introducing an online booking system to help improve their workplace efficiency as well as offer a high-quality, positive and hassle-free customer experience. Gone are the days where you have to keep the business phone, a pen and calendar on hand at all times. Waiting for customers to call, text, email or even send you a message on social media in order to book an appointment. Although this traditional method has been around for years it has proven to be particularly time-consuming and demanding on staff, often resulting in various booking errors, increased wait times and unsatisfied customers. Incorporating an online booking system means that you can reduce staff stress and errors, plus create an efficient business process allowing you to focus less on your front desk, and more on your customer’s experience. Additionally, not only can you easily control every aspect of your booking process, customers are also able to book and pay for your service directly through your website. Everything from picking the day, time and making a secure payment can be done all in one place at the touch of a button. According to the recent *CommBank GP Insights Report April 2018, tech-savvy and well-informed patients are increasingly demanding technologies that give them more choice and control – including self-managed bookings and payment systems. Further, the study also showed that a whopping 89% of patients surveyed are wanting to be able to book and manage appointments from a website. So, if you haven’t incorporated an online booking system into your business yet, now is a good time! Take Bookings 24/7 – Even if your business is closed, customers can choose to quickly and easily book online whenever suits them. Reduce Workload & Hassle-free Management – Staff and customers can control every aspect of the booking process – from date selection, time and payment. This means that your business will be far more efficient. Your work clutter will be lowered and the large amount of time previously spent on recording, sorting and managing appointments manually will be significantly reduced. Focus More On Your Clients, Less On Your Front Desk – By having an efficient and hassle-free booking process, staff are able to focus more on giving customers a high-quality experience. The Best of Both Worlds – Depending on your customer’s preference, you can choose to offer both online appointment booking and traditional phone-based bookings options. Fast and Easy Payment – Customers can pay for services upfront upon booking, at the click of a button. Significantly Decrease No Shows – Sending customers automated appointment reminders or accepting payment upfront helps to hold customers accountable and significantly reduces no shows. Staff profiles – Staff profiles lets you outline your staff members, their qualifications, specialisations and background. You can also outline when they are available for appointments and customise how much they charge for services. This also allows your customers to book specifically with a certain specialist or staff member. Automated Booking Reminders – Customers will automatically be sent an email confirmation upon booking, followed by a 24 hour reminder and a 5-minute reminder beforehand. Customers who have downloaded the app will also be able to receive push notifications. The staff member whom the appointment was booked with will also receive reminders. Manage Both In-person and/or Virtual Appointments- Whether you offer in-person services or virtual, you can manage the bookings for either one via your own HotHealth platform. If only some members of staff want to take virtual consultations (or vice-versa), specify which ones in the staff profiles setup. Payment – HotHealth gives you the ability to take payments at the point of booking an appointment. You can also set fees for late cancellation, allowing your business to reduce the time spent after the session fixing up invoices and missed business opportunities due to no-shows. Your branding – Finally, the HotHealth platform allows your branding to be at the forefront. The whole platform can be customised to match your business’ branding and colours, ensuring that the customer journey is consistent from start to finish. For customers and your business, offering online bookings is a no-brainer!